Licking can be a way your dog shares kisses and your cat takes a bath. But when licking becomes excessive, you might wonder if it’s time to call the vet. How much is too much? Allergies are the number one cause of excessive licking in dogs and a major cause for cats. The exact source of the allergy can be hard to pin down, so it’s essential to consult with a veterinarian. Pets can be allergic to anything from their food to your air freshener. Sometimes the allergy is triggered by something that gets directly on their fur and skin, like a floor cleaning chemical or the material in a blanket. A vet can help you work through the process of identifying and eliminating allergens. When your pet feels something painful or strange on their body, they don’t always know how to react. Confused, they may resort to constant licking for comfort. This is especially true when your pet has a wound or injury. Their response to the pain is to lick, chew, or drag the affected area. In many cases you can’t even see the injury. A vet can locate sources of pain that might be affecting your pet. A skin infection or parasite can be another cause of licking that’s quite uncomfortable for your pet. Likely culprits are fleas, mites, and ticks. These often can’t be seen by the naked eye, so don’t assume they’re absent just because you can’t locate them on your pet’s skin. Dogs and cats can also lick due to anxiety. A major life change, like moving to a new house, may cause temporary anxiety that your pet handles through licking and chewing. If it persists for more than 24 hours or causes bald patches, see a vet right away. They can recommend medications and treatments that ease anxiety and reduce the urge to lick. Studies have shown that licking releases endorphins in animals’ brains that make them feel calmer and more relaxed. Unfortunately, this can create compulsive behavior where the animal licks for the endorphin rush. It may be hard to accept that your pet is bored, but this is another cause of excessive licking. Perhaps your dog did it one day when she was bored, and now it’s become a habit. Additional playtime usually helps solve this issue. If you can distract your pet from licking with running around, playing with toys, and enjoying your company, the urge may be lessened later. Your pet may feel more tired, instead of bored, and less inclined to lick. Certain kinds of hormonal imbalances can cause licking. A malfunctioning thyroid or improper level of cortisol in the body can cause dry skin, itchiness, and a desire to lick. Beware of turning to home remedies for hormone imbalance. Vitamins and other home treatments can do more harm than good without a correct diagnosis. Consult with your vet. Sometimes licking is simply a reaction to dirt or skin buildup. The ASPCA recommends that dogs receive baths about every three months, or more often if they are frequently exposed to dirty and muddy environments. Cats rarely need to be bathed, and are vigorous lickers naturally. Start by brushing your cat gently to remove excess fur, and evaluating from there whether a bath is truly needed. And remember, your pet-washing liquid itself could be causing skin irritation. Use only sensitive formulas made specifically for pets, and end each bath by rinsing fur thoroughly with water. Still concerned about excessive licking? 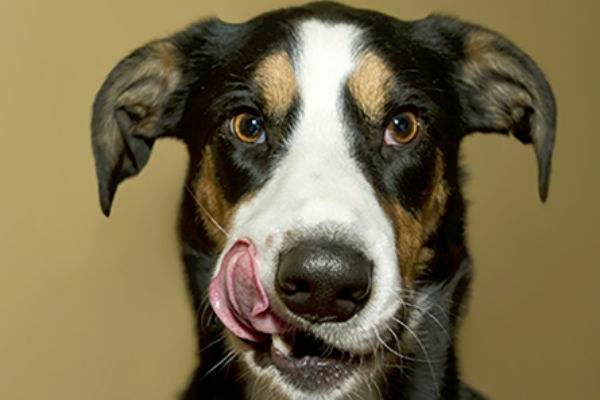 Reach out to Academy Animal Hospital or call 317.881.3125 to start a conversation about your pet’s licking habits.